If you are looking to work in the civil service then you could work in a variety of different roles depending on your skill set. But to do any role you will need to be very organised and able to work to very rigid procedures and policies. You will need a strong administrative background and good customer service skills for any role with an ability to be able to communicate effectively and confidently. 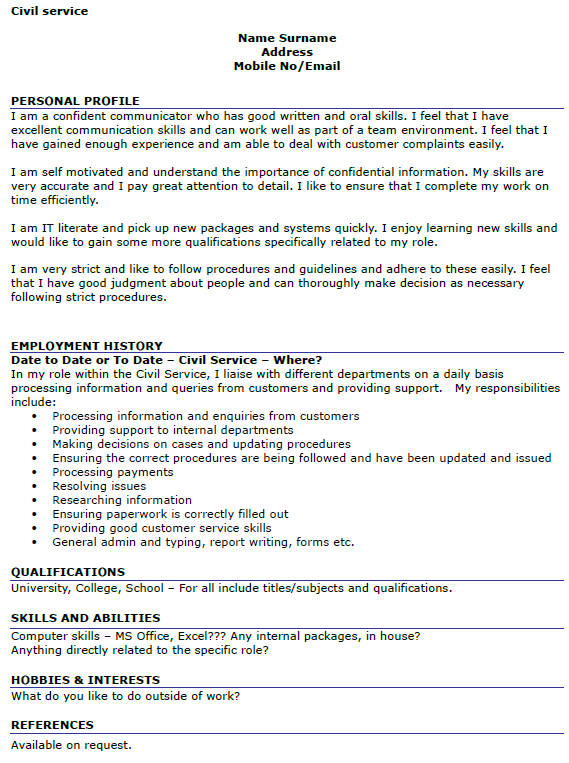 If you have seen a role within the Civil Service which you would like to apply for, please see the below CV example to help you update yours. I am a confident communicator who has good written and oral skills. I feel that I have excellent communication skills and can work well as part of a team environment. I feel that I have gained enough experience and am able to deal with customer complaints easily. I am self motivated and understand the importance of confidential information. My skills are very accurate and I pay great attention to detail. I like to ensure that I complete my work on time efficiently. I am IT literate and pick up new packages and systems quickly. I enjoy learning new skills and would like to gain some more qualifications specifically related to my role. I am very strict and like to follow procedures and guidelines and adhere to these easily. I feel that I have good judgment about people and can thoroughly make decision as necessary following strict procedures. Date to Date or To Date – Civil Service – Where? General admin and typing, report writing, forms etc. Computer skills – MS Office, Excel??? Any internal packages, in house? Anything directly related to the specific role?